TAMPA, Fla. (November 1, 2018) -- Every destination reveals its true self through its food. Each dish adds to a community’s unique story -- through the ingredients that blend seamlessly together, through the aromas that fill the air, through the tastes that linger on the palate. 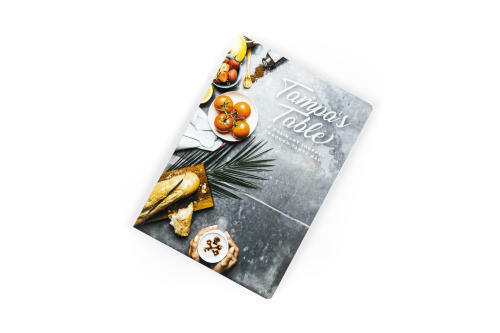 Visit Tampa Bay has captured the essence of its dynamic and daring food scene in Tampa’s Table: A Culinary Journey Through Tampa Bay. The trend-setting destination’s first culinary journal, Tampa’s Table combines luscious photography by Amy Pezzicara, essays by award-winning food writers Laura Reilly and Jeff Houck, and carefully curated recipes by Tampa Bay’s best chefs, bringing together the diverse flavors, tastes, and textures that tell the tale of Tampa Bay. The book invites food lovers to discover the treasures awaiting their taste buds in the hip, urban heart of Florida’s Gulf coast – a community with a vibrant and growing food scene where the palette of flavors ranges from the traditional Cuban sandwich at Florida’s oldest restaurant to cutting-edge culinary combinations from some of the Sunshine State’s most creative chefs. Along with mouth-watering recipes, readers will encounter the elements that have made Tampa Bay a one-of-a-kind world-class destination for travelers across the globe. They’ll learn the meaning of each ingredient in a traditional Cuban sandwich. They’ll also learn why Tampa Bay owes its success to a long-ago misunderstanding about guavas. Along the way, they’ll meet key figures in Tampa Bay’s booming food scene and see how the community’s culinary future is rooted in its humble past. Tampa’s Table: A Culinary Journey Through Tampa Bay will be available for purchase at the Unlock Tampa Bay Visitors Center (201 North Franklin Street, Tampa, FL) along with select local retailers. The culinary journal will also become part of Visit Tampa Bay’s domestic and international marketing program for 2019, starting with London’s World Travel Market in November. "Tampa&apos;s Table" is available for sale online, at the Unlock Tampa Bay Visitors Center, Blind Tiger Cafe, Brew Bus Brewing. Interviews are available upon request. Media and retailers interested in wholesale pricing can contact Stephanie Fred at sfred@visittampabay.com. The hip, urban heart of Florida’s Gulf coast beats in Tampa Bay. Explore the trove of attractions, dining and shopping options in Florida’s Most dynamic destination. Non-stop international air service puts your next Sunshine State holiday one flight away. Unlock Tampa Bay. Treasure awaits.